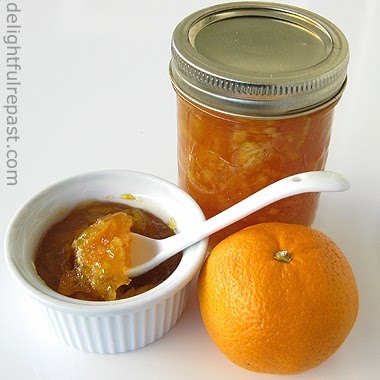 Tangerine marmalade can be made well past the traditional marmalade-making months of January and February (Seville orange season), using different tangerines as the seasons come and go. Satsuma, December-February; Page, January-March; Pixie, March-June; Minneola, April-June. This is my third and final post about marmalade--until next winter when I will probably post Seville orange marmalade. I've learned a lot since my first two posts, Satsuma and Meyer Lemon Marmalade and Meyer Lemon Marmalade. Though they are both quite good, they are rather heavy on the peel. Using more water improves the jelly to peel ratio. This recipe gives directions for how to deal with tangerines that, unlike Satsumas, are difficult to peel and have seeds. And it deletes the doneness test given in the other posts. I've discovered that marmalade has a better consistency when cooked considerably less than any of the popular doneness tests would have you cook it. If you're going to be making marmalade or any kind of preserves, you will need a scale. Though my old non-digital kitchen scale always got the job done, I heartily recommend the OXO Good Grips 11-pound digital scale. I use it nearly every day for one thing or another. By the way, the superb toast in the photo above was made with English Muffin Toasting Bread. 1 Scrub the fruit well. Cut the ends of the tangerines, and cut the tangerines in quarters lengthwise. Cut the peel off each quarter. Cut the peels (including those ends you cut off) into short, very narrow strips. Coarsely chop the peeled tangerines, removing all the seeds (pips). 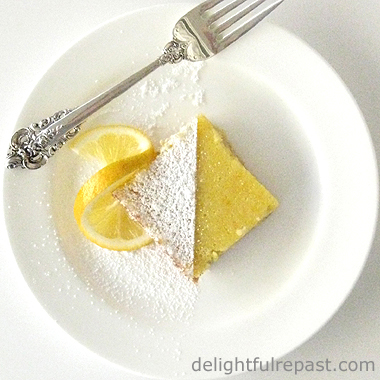 Trim a tiny bit off the ends of the lemons and discard those bits, then halve the lemons lengthwise. Cut each half into four wedges; remove the seeds (lots of seeds, probably two dozen, in a Meyer lemon). With the wedge on its side with the peel toward you, slice crosswise very thinly. Scrape the fruit and juice into your jam kettle (I use my 5.5-quart Le Creuset French oven). 2 Add water to the fruit in your jam pan. Bring to a full boil. Boil, uncovered, for 7 minutes; no need to stir. Remove from heat, cover and let stand at room temperature for 2 hours. Refrigerate for 8 hours or for a day or two. 3 When ready to make the marmalade, get your jars ready. Get out canner (or large pot deep enough that water will be 1 to 2 inches above the tops of the jars), two kitchen towels, 2-cup glass measure, thermometer, jar lifter, tongs, half-pint jars, new lids, bands. 4 Put a folded kitchen towel in the bottom of the large pot (unless, of course, you have a canner with a rack). Fill 2/3 full of water and begin heating the water. Heat extra water in a teakettle or saucepan. Submerge clean jars and new lids in the hot, but not boiling, water. They'll be hot in about 10 minutes, but just keep them below simmering until ready to use. 5 Bring fruit mixture to a boil over medium-high heat. Boil gently, loosely covered, about 30 minutes, or until peel is tender; no need to stir. Stir in sugar all at once until dissolved. 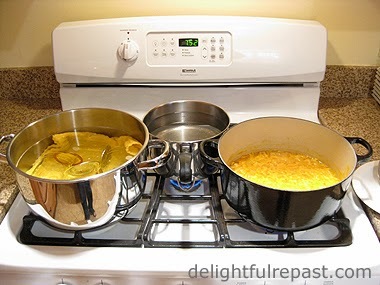 6 Bring mixture to a full rolling boil (big bubbles all over the pan that cannot be stirred down), stirring frequently. Keep it boiling hard for about 30 minutes, or until it registers 220 degrees, stirring occasionally, till the end when you will need to give it a gentle stir pretty much constantly. When done*, remove from heat and let stand for 10 minutes (keeps the peel from sinking to the bottom of the jars). Note: *Doneness can be difficult to determine. There are several tests recommended by various experts. I've tried them all, and they don't work for me. In my experience, they all result in overcooked marmalade. I cook it until it's 220 degrees and "looks right." If the marmalade has thickened and darkened a bit and it's 220 degrees, have the courage of your convictions and take it off the heat. After you've made it a few times, you'll get a feel for it. 7 Do one jar at a time. With tongs, remove a jar and lid from the water. Using the 2-cup glass measure, ladle the hot marmalade into the hot jar, leaving 1/4-inch headroom. Stick a knife or something (I use a chopstick) into the filled jar right next to the glass in about 4 places to release any air bubbles. Check the headspace measurement again and add more marmalade if needed. Wipe off the top of the jar with a damp towel, carefully place the lid and screw the band on (but don't tighten it). Repeat for all the jars. Put the water back on the heat. 8 Return filled jars to the water bath, adding enough hot water to have water 1 to 2 inches above the tops of the jars. Jars must be upright and not touching. Heat to a gentle boil, covered, and set timer for 10 minutes. Adjust the heat to keep the water at a simmer. After 10 minutes, move the pot off the heat and take off the lid. Let the jars sit in the water for 15 minutes. If you're not using a rack with handles in your "canner" and don't have a jar lifter, just ladle out some of the water so you can lift the jars out with an oven mitt. Remove the jars and set them on a kitchen towel on the counter. The lids will make a popping sound when they seal, so just count the pops as the jars start cooling. Leave them undisturbed for 24 hours. Then, if you lost count of the pops, check the seals by pressing on the center of the lids; they should be a bit concave and not move. Properly sealed jars are ready to be stored in the cupboard. Any jars that did not seal should be stored in the refrigerator. Note: Of course, it's nearly time to start thinking about Strawberry Freezer Jam and, in a few short months after that, Peach Freezer Jam. Karen, I'm so glad! Hope you'll try it soon and let me know how it turns out for you! I love orange marmalade, too. I wondered what kind of bread that was in your photo. Thanks for telling us...it does look delicious! And, Mildred, the bread is sooo easy that you can just whip up a batch any old time! Thanks, Diana! It's really good over ice cream, too. Amy, thanks! Yes, I do love experimenting in the kitchen. Got that gene from my mother. Thanks, Sully. The love of a long drawn out process in the kitchen is another gene I inherited from my mother! I love orange jam too. The aroma of seasonal citrus is just irresistible. Your marmalade looks scrumptious, Jean. Thanks, Angie! Yes, the aromas of all sorts of citrus are my favorite smells in the whole world! I think marmalade is the most rewarding thing to make. The jars are just so beautiful! I agree, Mr P. It's so satisfying to stand back and gaze at all those beautiful jars cooling on the counter! I've never had tangerine marmalade & I'm intrigued! :) I've never made proper marmalade, just freezer jam. I've always been put off by the process of sterilizing and those funky jar holder tong things lol. Give it a try, Anyonita; you might surprise yourself! It does seem like a lot of work the first time or two, but then ... something about it ... it gets rather addictive! That looks delicious, I have made three fruit marmalade out of season but not Tangerine Marmalade, great idea. Thanks! And if I can get my hands on some kumquats this month ... Here's hoping! 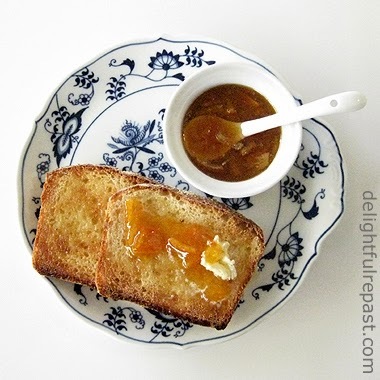 I'd love to have your homemade bread and expertly made marmalade for my breakfast!!! Both look divine!! Thanks so much, Liz! I do wish there was some for today's breakfast! Jean, your lovely marmalade inspires me to can a batch of a Meyer lemon version. Very thorough disserte on water bath technique. Nice work, my friend! Thanks, Brooks! I hope the post will encourage people who've thought water bath canning is too much bother to give it a try. Looks great Jean! You inspired me, as I mentioned in my reply to you on my site, to make some marmalade myself on the weekend I think. It's been AGES since I had it and your lovely picture was making me miss it! Thank you, Charles! It is such fun to make marmalade or jam, isn't it!